Click icon to download PDF version. Click icon to download high resolution image. Psalm 25 is one of several acrostic poems in the Bible (others include Psalms 9, 10, 34, 37, 111, 112, 119, and 145; Proverbs 31; and Lamentations). An acrostic poem is one in which the first line of each stanza begins with a letter of the Hebrew alephbet (alphabet). The acrostic form is lost upon the reader when translated. Futhermore, the initial Hebrew word of each stanza is not necessarily the initial word when translated. The author (David, as indicated in the opening stanza) of Psalm 25, as in Psalm 34, omits vav (presumably because there are only ten words in the Hebrew scriptures that begin with the letter vav), and adds an extra pe at the end. This appears to be in order to form the Hebrew word אָלַף 'alph from the first (aleph), middle (lamed) and last (pe) letters of the acrostic. אָלַף 'alph translated into English means learn. Additionally, ק (kop) is replaced with ך (resh), resulting in two consecutive stanzas beginning with resh in verses 18 and 19. In order to more fully appreciate the original structure of the psalm, the original Hebrew (Westminster Leningrad Codex) is shown line by line alongside the English translation (World English Bible). On the Hebrew side of the graphic, each initial letter of the acrostic is highlighted in blue, and a transliteration of the Hebrew is show above the inital word in red italics. On the English side of the graphic, the translated word that corresponds to the initial word in each stanza is highlighted in red (matching the transliterated word). The Strong's Number is shown above the highlighted word in gray. The Hebrew letters forming אָלַף 'alph are shown in green. The Personal Name of the Creator God in the original Hebrew is יְהֹוָה Yahweh, most often translated in modern English versions as LORD (all capitals), is highlighted in this graphic in purple. David also uses the Hebrew word for the Creator God אֱלֹהִים elohiym, most often translated in modern English versions as God, which is shown here in orange. 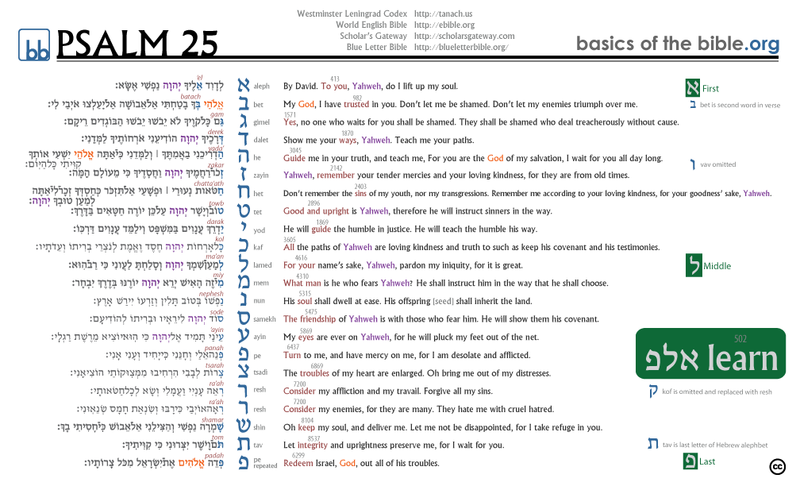 Finally, the PDF version of the graphic contains hyperlinks to Hebrew root parser and Strong's Numbers from Scholar's Gateway and Blue Letter Bible, respectively, allowing the viewer to further study the meaning of each word of the acrostic. Brug, John F. Near Eastern Acrostics And Biblical Acrostics Biblical Acrostics And Their Relationship To Other Ancient Near Eastern Acrostics. NEH Seminar: The Bible And Near Eastern Literature, Yale 1987, 1997 edition. Strong, James. The New Strong's Expanded Dictionary of Bible Words. Thomas Nelson Publishers, Nashville, Tennessee, 2001. Biblestudy.info contains an Interlinear Hebrew Old Testament version that is helpful in studying the original Hebrew alongside an English translation.